It was close to twenty years from Tinariwen's origins in a Libyan guerilla camp to their emergence as a musical force at the first Festival in the Desert in 2001, but the gestation period comes no surprise if you're aware of the background to a remarkable story. Recorded at a Toureg (actually, they're Kel Tamashek, or speakers of Tamashek) radio station in Kidal, Mali, The Radio Tisdas Sessions might be the first official album in the western sense by Tinariwen (original band name Taghreft Tinariwen, or edification of the lands) but it came after a series of cassette recordings distributed among Berber nomads and pastoralists in southern Algeria, northern Mali, Niger and Burkina Faso and the Libyan desert who had serious issues with various national governments. It has been a long struggle for the nomads of the Sahara, an endangered culture determined to survive despite traditional rivalries, ethnic cleansing, public executions, drought, exile, armed rebellion and guerilla warfare. From the time the band coalesced in those Libyan camps in 1982 until they moved to Mali’s capital, Bamako in 1999 Tinariwen were, to all intents and purposes, an underground movement calling for political and cultural self-determination. Founder and main songwriter Ibrahim Ag Alhabibe watched Malian soldiers kill his father, before he ended up in a Libyan training camp after a drought in the desert. Gadaffi was recruiting the disenfranchised Tamashek into his army, and between classes on revolution, Islamism and guerilla warfare, Ibrahim heard Bob Marley, Bob Dylan, John Lennon and Moroccan new wave rebels like Nass El Ghiwane and with his colleagues picked up electric guitars rather than traditional lutes, flutes, and drums to create music based on a form of compositional poetry called Assak and the traditional call-and-response pattern. Then there’s guitarist Kheddou, reputedly wounded seventeen times leading raids with a Kalashnikov in his hands and a guitar on his back, acquiring a reputation that came in handy when the PA system flown in for the first Festival in the desert was hijacked by armed outlaws. Kheddou happened to be travelling in the convoy and handled the negotiations that saw the equipment delivered safely to the festival site. 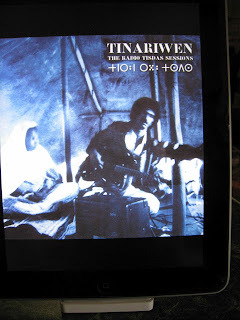 Given the guerilla activity and the political content of Tinariwen’s music it probably comes as no surprise to learn it was outlawed in Algeria and Mali though it was possible to buy cassettes under the counter in places like Gao, Bamako, and Timbuktu. Carrying a tape when you met the authorities was not, however, good for the bearer’s health. Tinariwen had returned to Bamako after a cease fire in 1999, performing at Tamashek weddings, baptisms and youth parties until they met up with French troupe, Lo’Jo (whose hometown is a sister-city to Bamako) and Justin Adams, who went on to launch the Festival in the Desert to showcase Tamashek music and culture and stimulate interest in the southern Sahara. The festival is a continuation of tribal gatherings where nomads meet, trade, race camels, engage in ritual sword fights and similar games, and celebrate traditional song, dance and poetry and is the world’s most remote musical festival, accessible only by camel or cross country four wheel drive from Timbuktu. After the first Festival, held during the first eclipse (and first full moon) of the millennium near the ancient ruins of Tamaradant brought Tinariwen to international attention, Adams and Lo’Jo decided to record Tinariwen, something that could only be done at a radio station where electricity was only available between seven in the evening and midnight. The sessions took two weeks, and The Radio Tisdas Sessions is, of course, the result. As far as the album goes, things are rather straightforward. There’s a verse from the singer, with the guitar following the vocal line, a chorus of campfire sounding voices, a guitar solo that twines around the basic melody and then it’s back to the mixture as before with not much apart from guitar, the occasional slice of bass, some elementary percussion and the call and response vocal. Assuming you’re not familiar with Tinariwen, the album’s opener, Le Chant des Fauves, is a logical place to start. What you hear there is, in essence, what you’re going to get the rest of the way through. The rhythm lopes along, the vocal line comes across as relaxed and the chorus chimes in over the top. Atmospheric is the operative word here, and the langorous atmosphere and around the desert campfire vibe is maintained through to the final track, recorded live at the first Festival in the Desert in 2001. 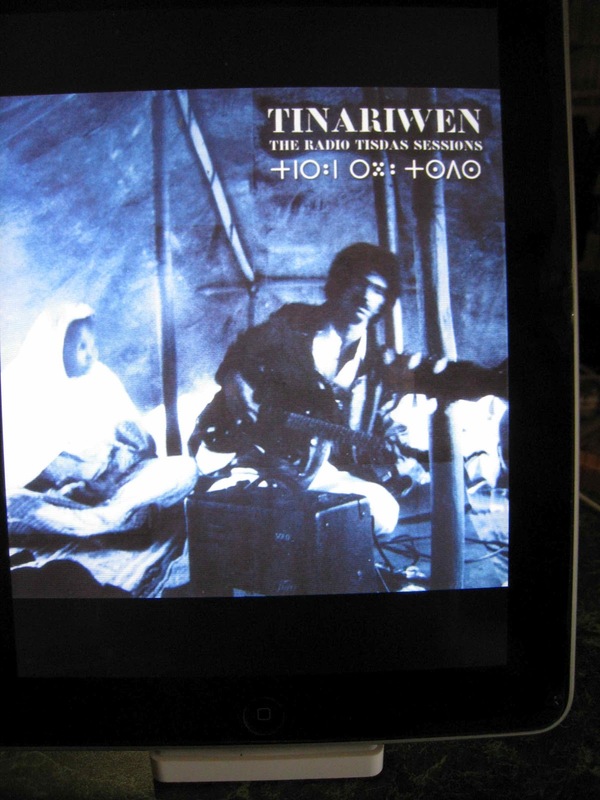 What’s on offer won’t be everyone’s cup of tea, but I’ve been impressed to the point where thi iTunes library now contains all Tinariwen’s stand alone album releases. Recommended, but sample Le Chant des Fauves first.